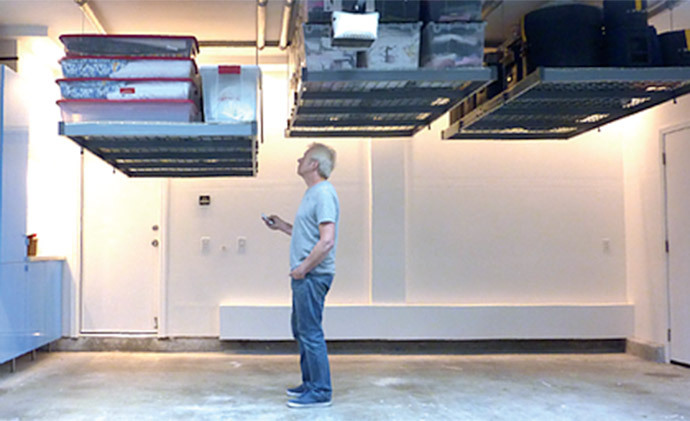 Compared to using a ladder for storing items, our motorized garage storage systems are easy and safe. Especially for storing heavy or bulky items which are dangerous, backbreaking and time-consuming. 32 square feet of stroage area. Lifts up to 400 lbs of boxes, hobby-gear, keepsakes, furniture etc. A handy remote control and two powerful 1/3 HP motors are included. Increase your home's value and attractiveness with our unique state of the art motorized garage storage system.